Seared 5oz Chicken Breast, Spec Ham, Mushrooms, Provolone Cheese, Marsala Demi Roasted Fingerlings, Chef’s Selection of Seasonal Vegetables . Includes Rolls and Butter, Dessert, Coffee, Tea, and Iced Tea. Cash bar. Salmon, Orange Miso Beurre Blanc, Jasmine Rice, Chef’s Selection of Seasonal Vegetables. Includes Rolls and Butter, Dessert, Coffee, Tea, and Iced Tea. Cash bar. Romaine and Iceberg Lettuce, Greek Potato Salad, Feta Cheese, Banana Peppers, Kalamata Olives, Tomato, Cucumber Onion, LOCC Vinaigrette, Grilled Flat Bread. Includes Rolls and Butter, Dessert, Coffee, Tea, and Iced Tea. Cash bar. Select one of the above entrees. Tax & tip included in price. After you register & select your meal, & complete payment, you must register again separately for each of your guests so that they can make their own individual entree selection. Select “New registration, you can continue using your email address and city. Then change the box with your name to that of your guest. Next select the entrée for your guest, confirm and complete payment. Repeat this for each guest. Blake Fuller, CEO of GO PUCK, holds the record for a production electric vehicle at the Pikes Peak International Hill Climb. He set this dangerous and challenging world record in a Tesla Model S P90D in 2016 and he will be sharing his experiences with us on Saturday, July 21st at 11:30 am at a luncheon at the Laurel Oak Country Club at 2700 Gary Player Blvd, Sarasota. This event is open to the public, but both club members and non-club members must register at our website and pay in advance for their lunch in order to get on the admittance list. Names will be checked at the door. You will not be able to register and pay at the door. If you cancel, payments are non-refundable. Blake will be speaking and taking questions from approximately 11:30 am until 12:30 pm. For a better view of the video, click on full screen box on the lower right. The luncheon will start at approximately 12:30 pm. There will be a cash bar. The lunch is a sit-down meal. Please select the registration type corresponding to one of the four entree selections. Please read the registration instructions above the "Register" button. You will have to register multiple times to select individual entrees for your guest(s). The Sarasota Supercharger, with 20 - 120 kW charging terminals, is less than 10 miles from the Country Club. 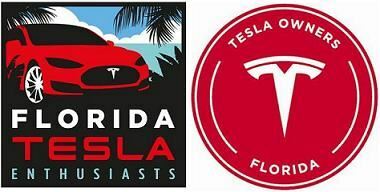 For attendees wishing to stay overnight, the Courtyard by Marriott Sarasota University Park/Lakewood is across the street from the Superchargers. Blake Fuller is no stranger to victory in top-level racing competition. At age 18 Fuller earned Rookie of the Year honors in 1999 at the Pikes Peak International Hill Climb and won the prestigious Open Class in 2002 along with numerous podiums finishes in all levels of professional motorsports since. Fuller's status as a revolutionary in the battery industry makes him an indispensable part of motorsports behind the scenes. In 2001, Fuller developed a new battery for his 2002 race winning hill climb vehicle that was 80% lighter than the car's original battery. In the decade since, "Batteries by Blake" have powered championship winning vehicles, including NASCAR, F1 and every IndyCar! Around 2012, he transferred his experience of designing durable, lightweight motorsports power to a more consumer electronics application. GO PUCK was born. Focused on being the world's most versatile battery, GO PUCK's Wearable Power serves the power needs of the 8+ Billion mobiles devices on the market. Now, the GO PUCK Tesla Model S serves as the vehicle (pun intended) to demonstrate the performance abilities of this Lithium Ion technology. In 2016 Fuller returned to Pikes Peak for the 100th Anniversary as an invited competitor and set a new record for a production electric vehicle at Pikes Peak International Hill Climb with a 11:48 run.